Big time in Albany, NY during November 2017! The “Votes for Women” exhibit at the New York State Museum opens November 4, 2017 in Albany, NY. The “Spirit of 1776” suffrage wagon has been exhibited in 2010, 2012, and during 2017. The show opening November 4th is the show of all shows. The suffrage wagon is part of the exhibit, and there is so much more to see. The video below is from 2010—a comparison, and one that we treasure. The upcoming show is a MUST SEE! What happened when the “Spirit of 1776” was exhibited in 2010! on Vimeo. This entry was posted on October 22, 2017, in Blog and tagged "Spirit of 1776", 19th amendment, 2017 suffrage centennial, New York, suffrage centennials. 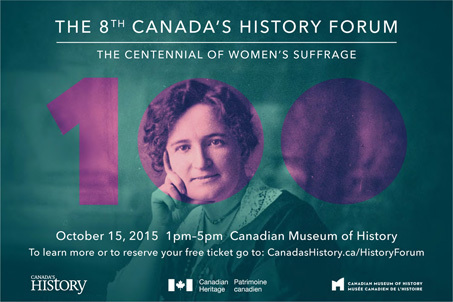 A conference entitled 2015 “Canada’s History Forum, The Centennial of Women’s Suffrage” is scheduled on October 15, 2015 to prepare for Canada’s 2016 women’s suffrage centennial celebration. The province of Manitoba granted women the right to vote in provincial elections in January of 1916. Women in Saskatchewan and Alberta followed shortly thereafter. The anniversary of the women’s suffrage movement’s accomplishments in Canada is an opportunity to reflect on the lives of dedicated women. By sharing their stories of perseverance and determination, this inspires young Canadian women today. The conference will be held at the Canadian Museum of History. 100 Laurier Street, Gatineau, Quebec K1A 0M8. For more information, visit the Nellie McClung Foundation. A Canadian human rights milestone will take place on January 28, 2016. One hundred years ago on this day, Manitoba women were the first in Canada and the British Commonwealth to be awarded the right to vote. OTHER NEWS NOTES: Columnist on New York History blog, Peter Feinman, expresses disappointment about dashed expectations within state’s history community about waning enthusiasm about I Love New York and Path Through History programs. One problem may be that specialty conferences are often thrown together with speakers and big names without much cohesion other than providing personal platforms for presenters. Feinman suggests that state officials weigh in on the state’s history in a broader way than viewing the history community and historic sites as just another version of a chamber of commerce. Long Island women joined parade in Smithtown, NY to bring attention to New York State’s 2017 suffrage centennial. The blog for LetsRockTheCradle.com highlights events commemorating the women’s rights movement. There’s still time to plan a trip to the cradle of the women’s rights movement in the United States. Anyone who loves a party should check in with the celebration underway of Suffrage Wagon Cooking School which has been in operation for one year. If your organization is looking for a way to raise money, follow SuffrageCentennials.com to find out dates and occasions to plan around. American history comes alive in the “Spirit of 1776” suffrage storytelling series. Bess, Edna’s best friend, narrates. She’s determined to be a free young woman at the turn of the 20th century. Will she succeed? Stay tuned as the episodes continue. This entry was posted on October 1, 2015, in Blog and tagged "Spirit of 1776", 2016 suffrage centennial, Canada, LetsRockTheCradle, Manitoba, Nellie McClung, New York History, suffrage, Suffrage storytelling. News notes from the Suffrage Centennial front! News Notes about women’s history features suffrage movement storytelling! on Vimeo. There’s more awareness and recognition than ever of the 95th anniversary of the ratification of the 19th Amendment to the U.S. Constitution. And individual states have been celebrating their accomplishments over the past few years. A bill to create a New York State suffrage centennial commission was approved during the 2015 legislative session by both houses. But the commission has no funding and lacks the governor’s signature. Stay tuned for news updates! The Upstate New York Women’s History Organization (UNYWHO) conference is set for Saturday, September 19, 2015 at Hobart and William Smith Colleges in Geneva, NY. The event is cosponsored by the Women’s Rights National Park. Sessions include women’s digital histories, U.S. women’s wartime activism, Women in WW I, second-wave feminism, colonialism and power, sexuality and the law, feminist documentary, and evidence and inference in women’s history. The New York Women’s Suffrage Centennial Conference is set for October 1, 2015 at the Holiday Inn, Waterloo/Seneca Falls, NY), 9 a.m. to 4 p.m. The New York Council for the Humanities and Generations Bank are conference partners with the NYS Cultural Heritage Tourism Network. Woodstock, NY is the first community to pass a local resolution supporting the NYS women’s suffrage centennial observance in 2017. Other towns and cities are expected to gather support on the local level. The “Spirit of 1776” suffrage storytelling series moved forward when Wilmer Kearns entered the narrative, as told by Bess, Edna’s best friend. Check out the two-part series about suffrage activist Charlotte Perkins Gilman and her story “The Yellow Wallpaper,” a revealing perspective by Wendy Bird: Part I, Part II. Four states have upcoming women’s suffrage centennial celebrations. The September program at Suffrage Wagon Cafe will feature the new book by Kenneth Florey about American woman suffrage postcards published by McFarland. Follow SuffrageCentennials.com on Facebook page, Twitter, email subscription, and the Quarterly Newsletter. Sign up for email on this web page. Stay up to date with postings, audio podcasts, and videos. Plan for your suffrage centennial event. And don’t forget to pass on family storytelling to the next generation. Suffrage Centennial videos on Vimeo. This entry was posted on September 1, 2015, in Blog and tagged "Spirit of 1776", 19th amendment, storytelling, suffrage history, suffrage movement, women's history, womens suffrage, Woodstock. New York State could blow its 2017 suffrage centennial celebration or it can lead the way to 2020! Just because New York State has an opportunity to market its unique position as the “Cradle” of the women’s rights movement in the United States doesn’t mean it will be successful. All the pieces are in place for New York to walk into the sunset with the entire nation and the world paying attention. This requires a correct balance of circumstances and attitude. If New York State believes it can bus people in from China and Australia and have them leave excited, it’s possible. And it’s more likely that the intentions will be good but there won’t be the necessary followup and input and grassroots support to make it work. The key is in bringing the right balance of excitement and connection together, to link the past and present and redefine the “Spirit of 1776” for a new time and place and set of conditions in this contemporary world. WE COULD BLOW THIS OPPORTUNITY, OR ALL THE PIECES COULD COME TOGETHER! Today the internet is exploding with stories of suffrage activists. Sometimes they’re called suffragettes. Other times they’re referred to as suffragists. In the past, some women preferred one term over the other which is why we here on SuffrageCentennials.com refer to votes for women advocates as suffrage activists. It’s important to not leave anyone out. Many different types of people were involved in shaking up the status quo during this time in history, including men and those who opposed the idea of women voting altogether. Women vote in high numbers today. More than at any other time in history, there’s a fascination with storytelling about the votes for women movement. We even find descendants of the anti-suffragists lamenting the day women won the right to vote. It’s essential the entire story of the suffrage movement be told: the warts, the compromises, the courage, especially the parts revealing the movement’s weaknesses and prejudices. LET’S TELL THE TRUTH, THE WHOLE TRUTH AND NOTHING BUT…! Women of the 20th century didn’t invent racism, classism, and sexism. They inherited it. We’re all born into this social and economic system where discrimination and prejudice is profitable, which is why women’s suffrage storytelling can bring us together as we peel back the layers. The storytelling about this remarkable social movement of our grandmothers and great-grandmothers, other family members and ancestors has the potential of completing the unfinished American Revolution, hopefully in our lifetimes. There are so many stories to tell. Women’s suffrage storytelling was featured on Suffrage Wagon Cafe on July 8, 2015. Storytelling features the women of the past reaching out through time to meet us where we are today. Transferring the messages and spirit and content into upcoming women’s suffrage events and celebrations is up to us. Let’s get together to celebrate suffrage centennial celebrations, whether in New York State in 2017 or the national observance of the ratification of the 19th Amendment in 2020! This entry was posted on July 10, 2015, in Blog and tagged "Spirit of 1776", 2017 suffrage centennial, 2020 suffrage centennial, Doris Stevens, Elizabeth Cady Stanton, suffrage centennial, suffrage history, suffragette, Votes for Women, womens suffrage. The New York State Museum, Library and Archives has issued a call to the public to give input and suggestions concerning the upcoming state suffrage centennial in 2017. There’s also more interest than ever in the 2020 suffrage centennial when the nation’s women will have been voting for a century. 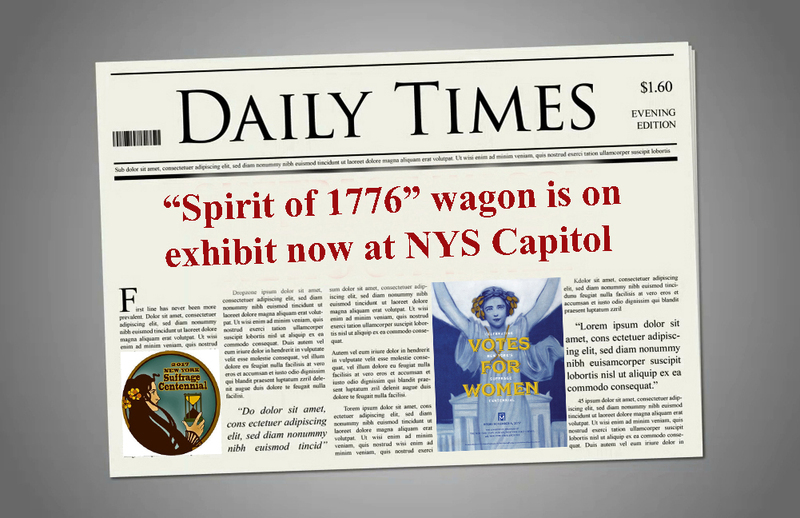 The “Spirit of 1776” suffrage campaign wagon in the collection of the New York State Museum will be exhibited in 2017 at the state museum in Albany, NY. An exhibit through June 2015 at New York City’s Municipal Archives is a preview of what’s being planned for the state’s suffrage centennial in 2017 when New York’s women will have been voting for 100 years. New York City government has staff working on the 2017 suffrage centennial. Projects in New York include fundraising for a statue in New York City’s Central Park to honor Susan B. Anthony and Elizabeth Cady Stanton. A message from Dr. Helen Pankhurst to American women voters is part of the upcoming four-day festival and celebration of the Suffrage Wagon Cafe opening on March 28. The festival runs through March 31, 2015. Dr. Pankhurst is the granddaughter of Sylvia Pankhurst and the great granddaughter of Emmeline Pankhurst, important leaders of the suffrage movement in England. Interest in Emmeline Pankhurst is gathering steam because of the upcoming major motion picture from the U.K., “Suffragette,” expected to be released internationally in October 2015. Meryl Streep has been cast in the role of Emmeline Pankhurst. This entry was posted on March 25, 2015, in Blog and tagged "Spirit of 1776", 2020 suffrage centennial, Central Park, Elizabeth Cady Stanton, Emmeline Pankhurst, Meryl Streep, New York State Museum, suffrage centennial, suffrage centennials, Women's History Month. This reading by Amelia Bolen is Part I of the story about how suffrage activists didn’t pass up the opportunity to attend the 1876 centennial celebration of the Declaration of Independence on July 4, 1876. In this first person account by Elizabeth Cady Stanton from her memoir, we’re treated to a visual blow-by-blow description of how these activists worked together to make their point and deliver a reminder that the nation’s women citizens would not rest until they’d made their point that the American Revolution remained unfinished as far as women were concerned. This audio recording is a suffrage centennial special. Image: Library of Congress. This entry was posted on July 4, 2013, in Events and tagged "Spirit of 1776", Elizabeth Cady Stanton, womens suffrage. Remember the NYS Legislature Resolutions for Spirit of 1776 suffrage wagon in 2013! Video. The “Spirit of 1776” is the name of a suffrage campaign wagon that’s part of New York State history. And it’s also representative of the national suffrage movement because it carries the theme that started in 1848 with the Seneca Falls Convention. The Declaration of Sentiments, written by Lucretia Mott, Elizabeth Cady Stanton and others rewrote the 1776 Declaration of Independence to include women. In 1913 the “Spirit of 1776” wagon began its journey in Manhattan and headed to Long Island for a month of intensive grassroots campaigning. The women wore colonial costumes to deliver their message of “Taxation without representation was tyranny in 1776. Why not in 1913?” With the presentation ceremony in Manhattan covered by New York and Long Island papers, the horse-drawn wagon emphasized the theme of the “Spirit of 1776,” the wagon’s name and references to equality, what the activists insisted were the founding principles of the nation. Because social movements don’t always have artifacts and memorabilia that lend themselves to exhibition, this suffrage wagon has come to represent the national theme of the movement, the “Spirit of 1776,” that was repeated in suffrage speeches, events, literature, and visual rhetoric. For more information: #1. #2. #3. Image: Puck, Library of Congress. Reading by Amelia Bowen. This entry was posted on June 30, 2013, in Blog and tagged "Spirit of 1776", Declaration of Sentiments, Seneca Falls Convention, suffrage wagon, womens suffrage.